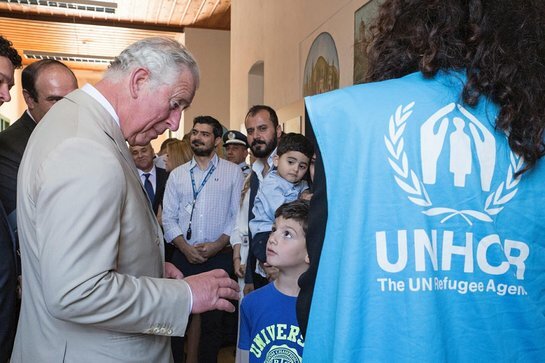 Their Royal Highnesses the Prince of Wales and Duchess of Cornwall, last week met refugees benefitting from pioneering EU-funded accommodation programmes run by UNHCR, the UN Refugee Agency, on the Greek island of Crete. The Prince visited the village of Archanes on the slopes of Mount Giouhtas and also met local dignitaries and staff from the Heraklion Development Agency (HDA), which is implementing the European Union-supported ESTIA (HOME) accommodation and cash assistance programme for UNHCR in Crete. UNHCR Representative in Greece Philippe Leclerc and HDA Refugee Project Director Dimitra Kampeli briefed the Prince on the accommodation programme, which has benefitted more than 45,000 refugees and asylum seekers across Greece since it was launched by UNHCR in early 2016. More than 800 people have benefitted from ESTIA in Crete, where there are 150 apartments in Heraklion, Chania and Sitia. The Prince, later joined by The Duchess, met some of these refugees as well as members of the host community. They heard about the efforts to integrate the refugees, including access to education and health care, and the launch of a pilot programme to help unaccompanied children prepare for adulthood in safety. The Supported Independent Living (SIL) project, aimed at unaccompanied children aged 16-17 years and launched in Heraklion in April. It has three boys who share an apartment, study Greek and build their resilience and life skills before they become adults. UNHCR is introducing this kind of alternative care to Greece for the first time and hopes to expand it. The UK has much experience of SIL programmes. The Royal couple met Iraqi and Syrian refugee families with young children living in apartments under the accommodation programme, including a Syrian father looking after two young boys on his own. They discussed the challenges they faced and their desire to build a life and integrate into Cretan society. They then attended a colourful cultural event before departing at the end of their visit in Greece. The Royal visit has generated much interest in Greece. “We welcome the visit of their Royal Highnesses, which is helping to put a spotlight on something very positive arising out of the difficult refugee situation that Greece has been bearing for the last few years. The focus is turning now to integration,” said UNHCR’s Philippe Leclerc. The ESTIA programme has been embraced in Crete, where UNHCR has established strong relationships with local municipalities to ensure success. The refugees have received a warm welcome and many have said they would like to remain in Crete, including Cretan-speaking Muslim families whose ancestors had fled the island during the 1897 Greco-Turkey War and sought shelter in western Syria. At the same time, some families hope to be reunited with family in other countries and on the day of the visit a family from Kuwait were flown to the United Kingdom to be reunited with relatives. The ESTIA programme currently provides more than 24,500 apartment places across the country. There is currently and estimated 51,000 refugees and migrants in Greece. It has helped move the most vulnerable into safe and appropriate housing.